George Zimmerman says he still gets death threats. He's still accused of racism and he remains a lightning rod for criticism. But in the end, he told CNN, there's only one judge who matters. Does Zimmerman regret what happened? His run-ins with law enforcement since the trial's July conclusion have kept his name in the headlines. He's recently drawn renewed criticism for using his notoriety to hawk his own artwork. And now, the man who once aspired to become a police officer tells CNN he's hoping to go back to school and pursue a career as a lawyer "to stop the miscarriage of justice." "I'd like to professionally ... continue my education and hopefully become an attorney," he said. "I think that's the best way to stop the miscarriage of justice that happened to me from happening to somebody else. I don't think it should ever happen to anyone ever again, not one person." Zimmerman maintains that he acted in self-defense within the law when he shot Martin. And he says he was a scapegoat for "the government, the President, the attorney general." Among the misconceptions Zimmerman says still linger about the case: that he's never apologized to Martin's family. He said he still thinks about everybody involved: about Martin's family, and his own. He said he regrets going out that night, but -- citing a pending U.S. Department of Justice civil rights investigation -- says he can't answer whether he regrets killing Martin. He said he'd like to reach out to Martin's family and apologize, like he did during his 2012 bond hearing. "I would say exactly what I said on the stand," he said, "that I'm sorry for their loss." At the time, attorneys for Martin's family called the courtroom apology a self-serving act by a man facing a life prison sentence. Now, Zimmerman's no longer facing prison time -- but a string of run-ins with the law since his release have repeatedly sent him back into the spotlight. It started with a speeding ticket. Next, Zimmerman's wife called 911, saying he was threatening her and her father with a gun. 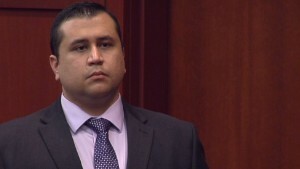 There were no charges, but Zimmerman's wife later filed for divorce. Then, Zimmerman's girlfriend accused him of chasing her with a shotgun. This time, Zimmerman called 911, to get his side of the story out. His girlfriend later said she wanted charges dropped and lifted a restraining order against him. 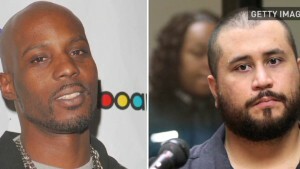 Just when Zimmerman's name had faded from the headlines, it came up again this month with reports that he'd be participating in a boxing bout with rapper DMX. After backlash surged, the promoter canceled the fight. Zimmerman says the whole thing was a misunderstanding -- and that there were never any racial overtones when he signed on to do the event for charity. "It was going to be an unknown person and be a smaller event," he said. "If I went out there and got beat up, the charity was still getting paid," he said. "I don't want to get beat up, but I saw it as an opportunity. I never expected it to be, to turn out the way it did." 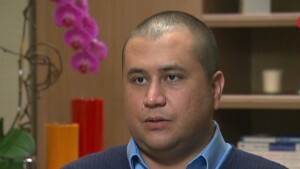 Even though his name since the trial has repeatedly made the news, don't expect Zimmerman to comment on current events. Asked by Cuomo to weigh in on the case of Michael Dunn, a Florida man who killed an African-American teen after a dispute over loud music, he said he didn't know enough details. "I don't watch news anymore," he said. "I watch comedy shows, home improvement shows. So I'm not well enough informed to give you exacts." During his interview with CNN, Zimmerman's girlfriend and her young daughter wouldn't leave his side. Neither, it seems, will controversy -- thanks, in part, to his new hobby: painting art, and selling it. Zimmerman admits he's pushed to get publicity for his artwork. And it's worked. His first painting sold for more than $100,000 on eBay. "To be honest, I was hoping to be able to provide a decent lifestyle for my family," he said. In an interview that aired on the Spanish-language Univision network Sunday, Zimmerman said he was unemployed, had a personal debt of $2.5 million and wasn't receiving any government benefits. But aside from the possible financial boost, Zimmerman said one painting -- a portrait depicting Special Prosecutor Angela Corey and slamming the U.S. judicial system -- had a deeper purpose. "It was a creative, tangible forum to show my inner thoughts, my inner feelings. ... It provided a tremendous release for me," he said. 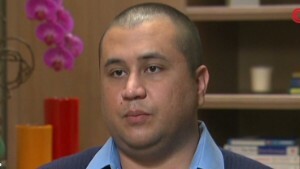 Zimmerman says he still gets death threats. "I have a lot of people saying that, you know, they guarantee that they're going to kill me and I'll never be a free man," he said. "I realize that they don't know me. They know who I was portrayed to be." People who accuse him of being racist, he said, don't understand that he was raised by Peruvian family members and that some members of his family are black. "Before the trial, during and after, I've learned that the majority of people, when they sit down with me one-on-one or with my family, they get a completely different perspective on me," he said. But that doesn't change the anger that many people feel about his case, Cuomo told Zimmerman. "This case became a metaphor, an example. Your face became the face of, 'This is the guy who gets away with killing a black kid,' " Cuomo said. "What do you do with that?" 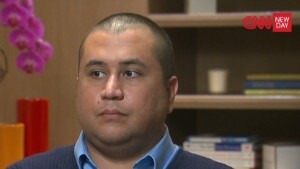 Zimmerman says he'll keep fighting that accusation, for as long as it takes. "If it takes one person a day at a time to help them realize that's not what this case was about," he said, "then that's what I'll do."